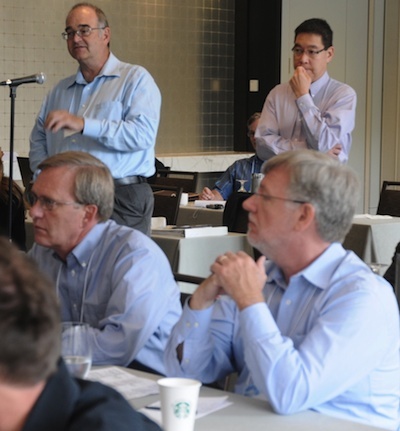 Day three of the SEG IQ Earth Forum had more organizational diversity than the previous two days. The morning session was on seismic for unconventional plays. This afternoon was for showcasing novel implementations of seismic attributes. List all of your uncertainties and come up with a single test for evaluating each, holding all other variables constant. Make sure you collect enough data so that results are statistically valid. Make your experiment scalable — 10 measurements must be extrapolatable to influence hundreds. To better understand production heterogeniety, they drilled and fracked three wells in exactly the same way. Logging and microseismic surface monitoring showed a tight limestone zone that was liberating gas from a strike slip fault, previously unseen. The best talk for interpreters so far was from Randy Pepper, who has done basin-scale modeling to define the erosional and non-depositional periods of geologic history not captured in the rock record. 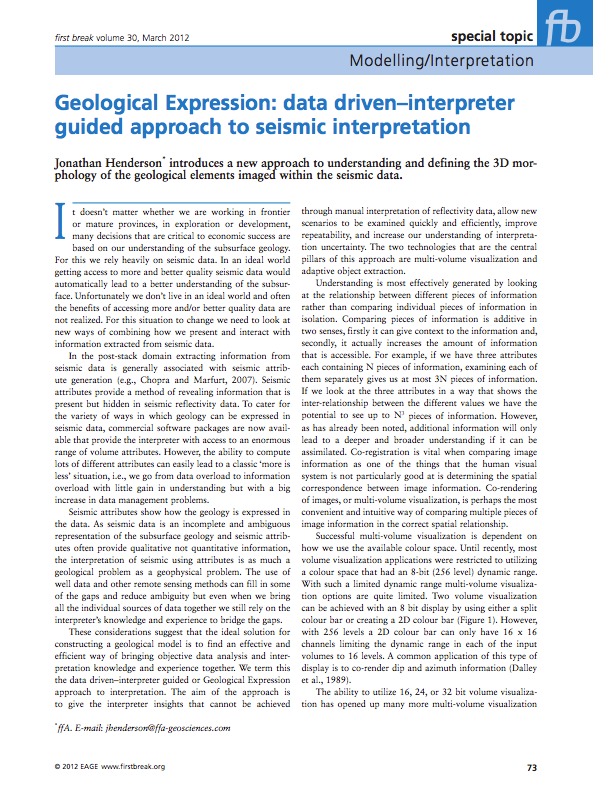 He used Wheeler diagrams to transform between two different representations of the same data, so that interpreters could work interactively between the structural and stratigraphic domains. It reminded me of dGB's Horizon Cube technology, allowing interpreters to explore between the mappable horizons in their data. Next step: allowing interpreters to perturb structural restorations on the fly. If you showed a seismic amplitude map to a radiologist, they might form completely rational arguments for arteries and other anatomical structures. Interpreters sometimes see what they want to see, which can be a problem. My favorite talk so far was from Jonathan Henderson from ffa. He is dedicated to keeping art and expertise in the interpretation process. His company has developed software for building data-guided geobodies with an organic and intuitive design. Automatic data classification can only go so far in elucidating what the human brain can perceive. Read his article. Adaptive Geobodies: combining art and science. Kudos to John for ending the talk with a video demo of the software in action. Gasps from the crowd were a plenty. I'm hoping for more of this tomorrow! This definition seems quite strict, but it open to interpretation. 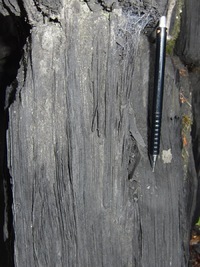 'Ten percent of the sedimentary clasts' might be a very small volumetric component of the rock, much less than 10%, if those 'clasts' are small enough. I am sure they meant to write '...10% of the bulk rock volume comprising clasts having a grain size...'. Subsurface science in the oil industry has gradually shifted in emphasis over the last five, maybe ten, years. In 2000, much of the work being done in our field was focused on conventional oil and gas plays. 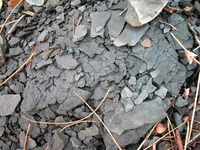 Today, it seems like most of what we do has something to do with unconventional resources. And this is set to continue. According to the American Petroleum Institute, unconventional gas production accounts for almost 50% of today's US Lower 48 production total of about 65 billion cubic feet per day, and is expected to reach 64% by 2020. In Canada, where unconventional gas is also very important, unconventional oil is at least as significant to geoscientists, especially bitumen. According to the Alberta govermnent, production from the Athabasca oil sands in 2011 will be about 2 million barrels per day.